In this frame we come to the second large hangar complex of Area 51, the North Ramp area. 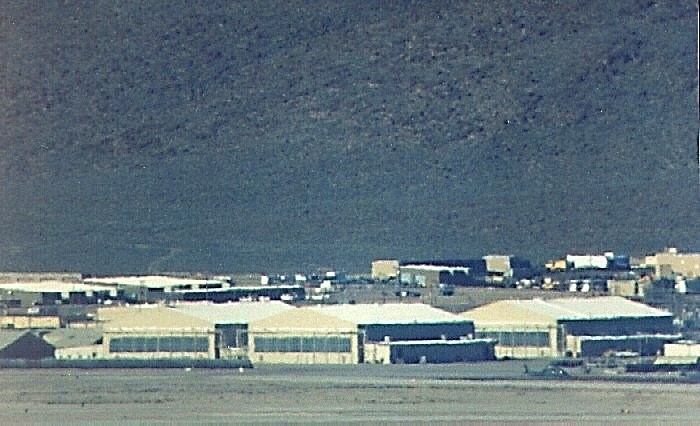 The photo shows the four large hangars, and part of the north ramp in front and right of the hangars. These hangars were originally used for the A-12 and YF-12 development in the 1960's. Later they housed captured Russian MiGs that were secretly evaluated at Area 51 by the so-called RED HAT Squadron. Since then, they have been known as the Red Hat Hangars. It is not known exactly what is inside the hangars today. Sometimes the doors can be seen open from Tikaboo, and jets can occasionally be seen taxi in and out. However, due to the distance it is difficult to tell the type of aircraft. Quite possibly the Red Hat Hangars are still being used for the evaluation of foreign (i.e. potential enemy) technology. Parked on the ramp in the foreground, which once was the north end of the old U-2 runway, is a MH-60 Pave Hawk helicopter. Newer satellite photos show that there are three marked helicopter pads on the ramp, and there are as many Pave Hawks in service at Area 51. They are used for perimeter security, and for general utility work, such as servicing the unmanned Bald Mountain radio facility. Hangar 4: Located in the SE corner is Building 200. Hangar 5: Located in the NE corner is Building 202. Hangar 6: Located in the NW corner is Building 208. Hangar 7: Located in the SW corner and out of view here is Building 206.